Vocabulary (within the game, or while using other cards/picture cards/etc). 1. Don’t Break the Ice In this game your players take turns one-by-one using their hammer to push out each piece of ice in the “pond.” The object is to keep the little ice skating bear UP! Little ones have a blast with this game! 2. 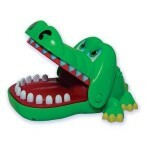 Crocodile Dentist Mr. Crocodile has a bad tooth…but you don’t know which one! Players take turns pushing down each of his teeth one by one trying to be careful NOT to touch the painful tooth! If you do, he will try to bite your hand! I find some little ones are afraid of this game, while others LOVE it! So I suggest doing a trial run and really showing the kids how it works if they are little ones before you start. 3. 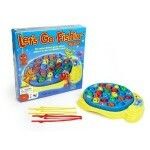 Let’s Go Fishing In this game many fish are swimming around the pond opening and closing their mouths. Players take turns trying to catch a fish! 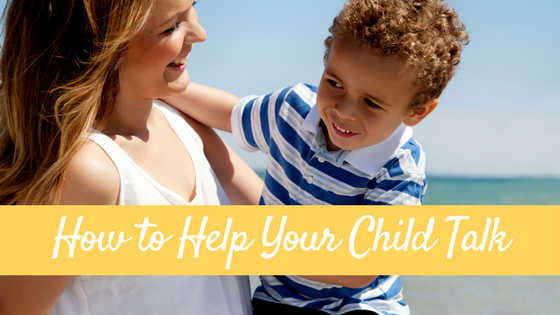 This game can be difficult for little hands so I often have 3 and some 4 year olds hold the fishing pole close to the “hook”. I also teach the children to find ONE fish, and then follow it around until it opens its mouth and THEN hook it. 4. What’s in Ned’s Head? OH this game is a HUGE favorite! 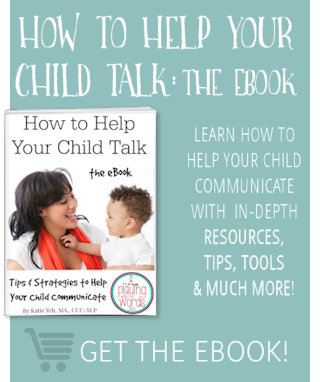 I use this with preschool up to middle school! 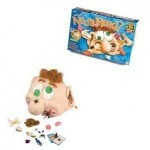 In this gross game, players take turns choosing a card and reaching into Ned’s ears, nostrils or face to find the object pictured. If the thought of reaching in someone’s giant nose already grosses you out, then this isn’t the game for you as the stuff IN his head is pretty gross too!! (I actually have removed a couple of the really gross items before when playing with some populations/ages). 5. 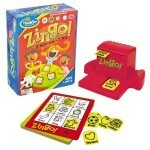 Zingo According to the manufacturer: “In this fast-paced, energetic variant of Bingo, kids get a kick out of pulling the Zinger forward to reveal two mystery tiles, and then try to be the first to call out the tiles that match the images on their cards. The first player to fill his or her card wins by yelling “Zingo.” Two levels of play add zing to the competition.” I have used this from preschool through even middle school! 6. 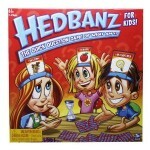 Head Bandz This game is simply AMAZING. Each player picks a card from the deck and places it on their headband for everyone else to see. 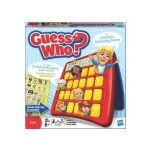 Players then take turns asking the other players questions to try to figure out what is pictured on their card. I have adapted this to use with younger children and have also done the opposite: had other players describe the pictured cards to each other to try to get them to guess what it is. 8. 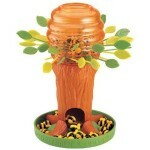 Honey Bee Tree This game is just like Kerplunk. There is a bee hive full of sleeping bees…as the bees nap players take turns removing the leaves, being careful not to “wake” them (i.e. have them fall). The winner is the the one with the least bees at the end…OR…the most if you want to play it that way! I actually had Kerplunk and used it with my preschoolers through middle schoolers but when I left it behind at my former district I replaced it with this one and I LOVE it!! 9. Jenga The classic game where players take blocks out from the bottom of the tower carefully and place them at the top…this one is awesome for three and up! 10. 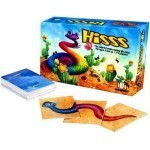 Hiss This game has surprised me…when I bought it several years ago I didn’t think it would be mush of a hit but I was wrong! Kids LOVE building snakes! I have to admit that I don’t even know the real rules to this game! I make up my own and tailor it to each group. And it is a great game to use while working on the SN cluster! 11. 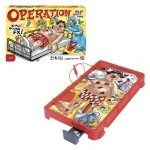 Operation The classic operating game…most kids LOVE this. However little hands typically are not ready for this game so I will imply take the batteries out! 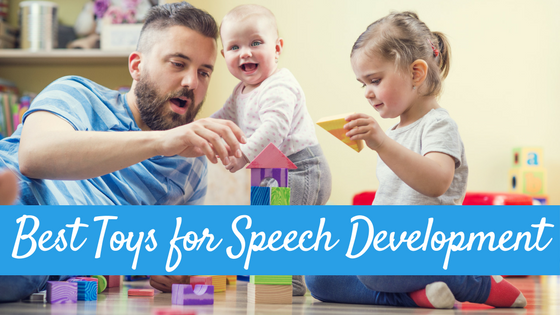 Then the kids can work on fine motor skills (and language of course!) without the pressure of the BEEP! These next three are great to get AWAY from the table! 12. 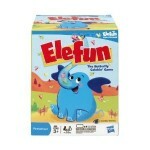 Elephun This is SO FUN! The elephant blows butteries all over the the players need to catch them in the nets. This gets the kids AWAY from the table and having fun! 13. Bowling Another favorite in my speech room has always been bowling. I have a cheap set I got at Target and it works GREAT! To make it easier, you can place stickers on the ground where the pins need to be set up and then use tape to provide a place for the kids to stand to throw the ball. I had a set of twin boys a couple years ago who asked for bowling nearly every day! And guess what? I would get 250 prductions EACH in 25 minutes. VERY motivating! 14. Ring Toss I also bought a cheap ring toss game at Target a few years ago (probably the same day I got the bowling set?). 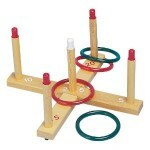 Some kids who are not so good at throwing may not like it, but generally most of my kids really enjoy this game. I never played for points but some sets come with point values too! And, my absolute FAVORITE game I use for ages 2-6 is…..
15. 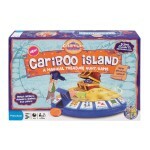 Cariboo I bought this game years and years ago and to my dismay they don’t even make this exact game anymore! No fear though, as they now make Cariboo Island. (Sidenote, when I went to Amazon they are selling my version for….are you ready for it? $90!!!!). Anyway…this game can target colors, shapes, letter ID, and vocabulary all on its own. In the version I have, there are 6 colored balls hidden under the pictures and you must find all the balls to open the treasure box (there are golden coins in the Island version). This is hands down my most favorite game EVER! I recently played it with my daughter and my nephew (3 and 2 1/2) and we had a BLAST! Also…I totally don’t play it the way you are supposed to…I always modify it! 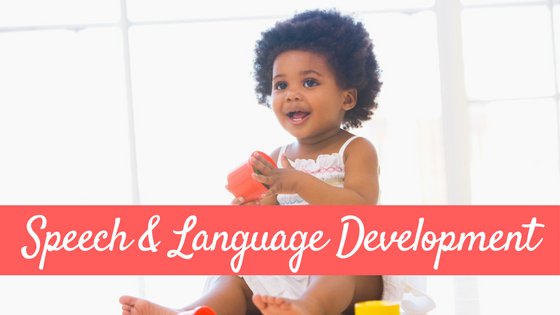 What are YOUR favorite games to play with your children or students? Why? I’d LOVE to hear! This past November I went to ASHA and there was a session on using games during therapy. My absolute favorite has got to be Angry Birds! 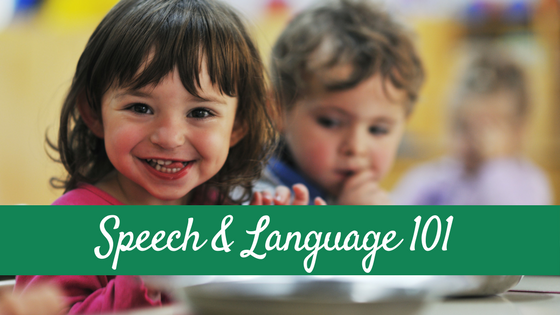 Great for following directions, concepts, describing and carryover of artic sounds! 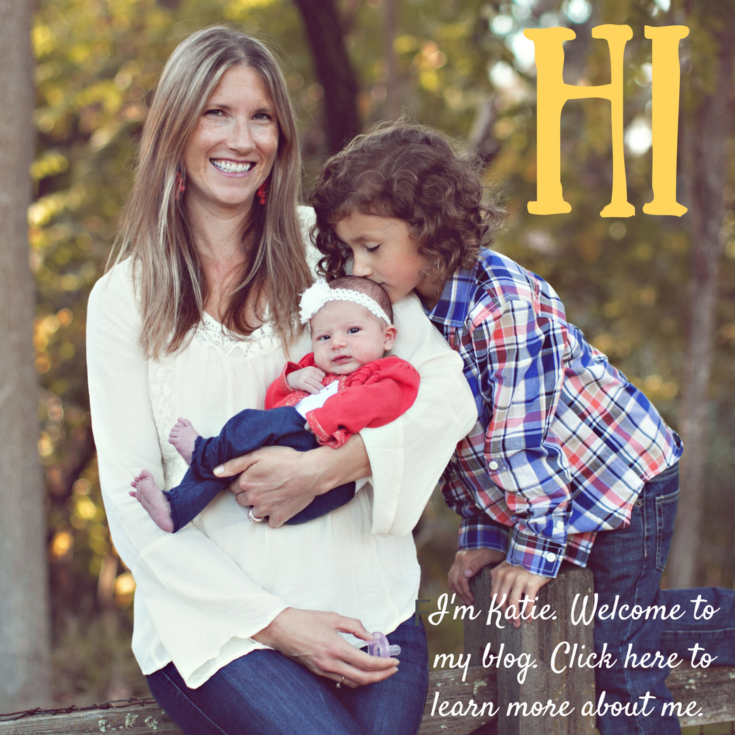 I’ve recently found your website and love it! Great ideas and links. Thanks so much! Amy I have an Angry Birds bean bad toss game! I totally forgot about it. I haven’t used the game in therapy yet but I have heard its AWESOME to use! Thanks for the great suggestion! 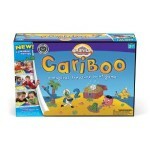 Cariboo is my favorite game too. I modify it by using Boardmaker icons for themes, target vocabulary, or specific to articulation targets. I store them in an index card expended folder and label the tabs. I have also modified if by having matching cards and the magic key in a small container (e.g. old Orbit gum container) and students have to take turns passing the container, opening the box, and finding the matching card on the game, and finally removing the key (it’s great for teaching sequencing). 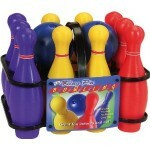 But the game box can’t move, otherwise the balls will move and the game won’t work (which is perfect for inhibition)! 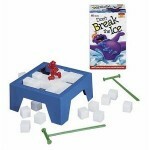 Don’t Break the Ice can be modified by using only one hammer and passing it. I also put stickers on the cubes and students have to name or say the artic. target before they start hammering. I have also modified go fish in the same way, I put little stickers on the fish tails and students have to label or practice artic when they catch the fish. I know use an iPad 2 for lots of therapy but my students by far prefer to play with real toys and games! Fantastic modifications! Thanks SO much for sharing! I also modify all the games to work on artic and I have done the trick with only using one hammer! 😀 And you know, I have NOT used my iPad in therapy yet! Soon, soon…. These games sound great! Thank you for the amazing ideas!